These are easy to make – and so rewarding to the eyes and the taste-buds! 2. Lightly grease a 13×9-inch baking pan. 3. In a bowl, combine flour and 1/3 cup brown sugar; cut in butter until mixture resembles coarse crumbs. Press into prepared baking pan. 5. Meanwhile, in a mixing bowl, beat egg. Add salt, remaining 1/3 cup brown sugar. 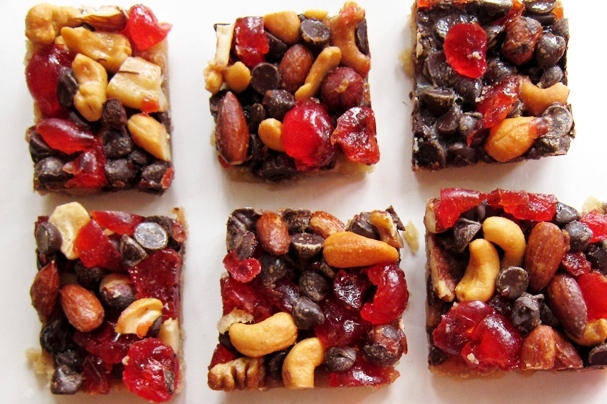 Stir in the nuts, cherries and chocolate chips. Spoon evenly over crust.